“The city carries a story, the city presents a lure into its own version of the past, you could say it tells tales, that it lies.” Marina Warner, Monuments and Maidens. “to escape is the greatest of pleasures; street haunting in winter the greatest of adventures.” Virginia Woolf, Street Haunting. One of the things I love about London is that many of the places that make it distinctive aren’t obvious. Grand plans and remodelling on a citywide scale never seem to have worked in London, so it doesn’t possess the triumphant avenues, boulevards and grid layouts of other major world cities. Growth here has been more organic, uncontrolled and sprawling. This means that amongst and behind later generations of buildings, you can often find old churches, museums, wonderful little shops, pubs, statues, houses, gardens and even whole streets tucked away, almost hiding. Another thing I like about London is that its size ensures that there are always ‘new’ places to discover. Whether you are passing through, or a long term resident, if you walk around there’s always the potential to be surprised, even charmed by something you encounter along the way. Anyone, of course, can can pick up a guide, history book or even a map and take a short cut to discovery – heading for specific places mentioned within and ticking them off a list.”Seen it. Done it.” Personally I’d rather let chance take a hand: stumbling across a somewhere I’ve never been before always feels more satisfying. 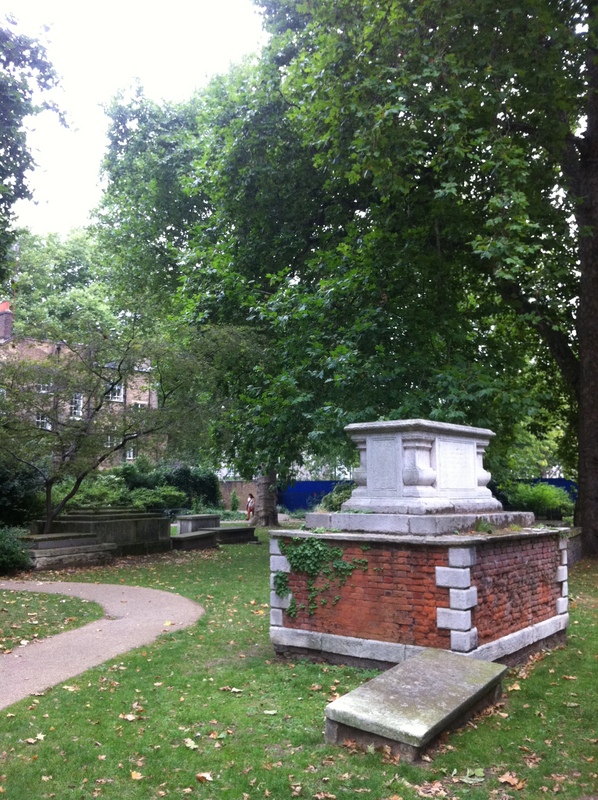 One such place I’ve encountered recently is St George’s Gardens in Bloomsbury, whilst mooching about one Sunday afternoon in and around Skoob Books in the Brunswick Centre and Marchmont Street. This is an area where elegant redbrick mansion apartment blocks mix it with more recent concrete ones in a scattering of streets below Euston Road and St Pancras, in between the busy thoroughfares of Gray’s Inn Road and Woburn Place. The garden is not exactly hidden and is probably used by hundreds of people who live and work in the area, but somehow despite passing close by often for some years – especially the nearby Brunswick Centre and Coram’s Fields, I’ve missed it until now. Perhaps because neither Heathcote Street nor Handel Street, which lead inside are through roads, to the south are private and hospital buildings inbetween the wall and Coram Fields, whilst Regent’s Square to the north skirts the gardens completely; so there’s little chance of catching a glimpse of them on the way to somewhere else. 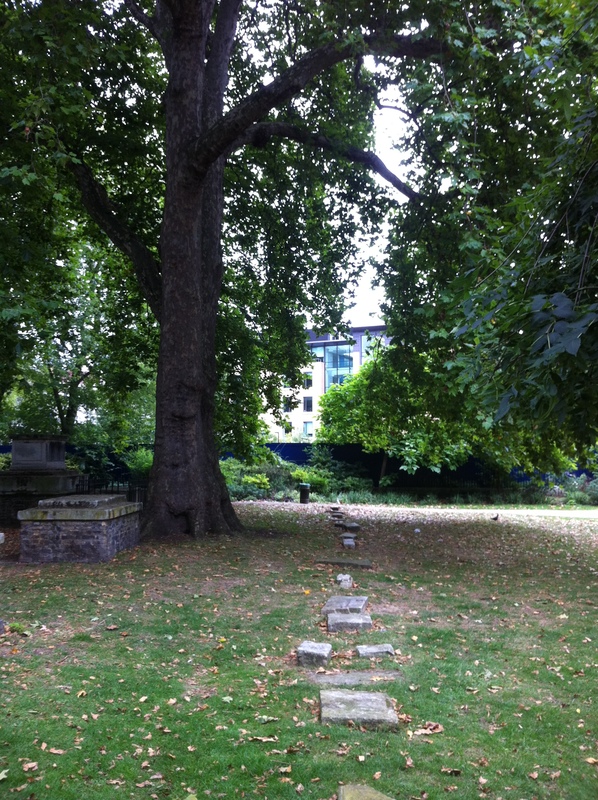 Originally a burial ground – the land was purchased for this purpose in 1713 – it was one of the first to be positioned away from the churches it served. The site quickly became overcrowded and by the middle of the next century – 1855 – it was closed down, reopening thirty years later as a public garden for the local poor. Restored in the early 1990s it was one of the first public spaces to be supported by the National Lottery. Walk in through one of the gates and ambient urban noise levels seem to drop into near silence, as if by stepping inside you trigger an automated, atmospheric tribute to the garden’s past: although I doubt things are quite so hushed on a bustling Friday lunchtime. The surrounding area is great for aimless wandering, especially the stretch of independent shops on Marchmont Street. 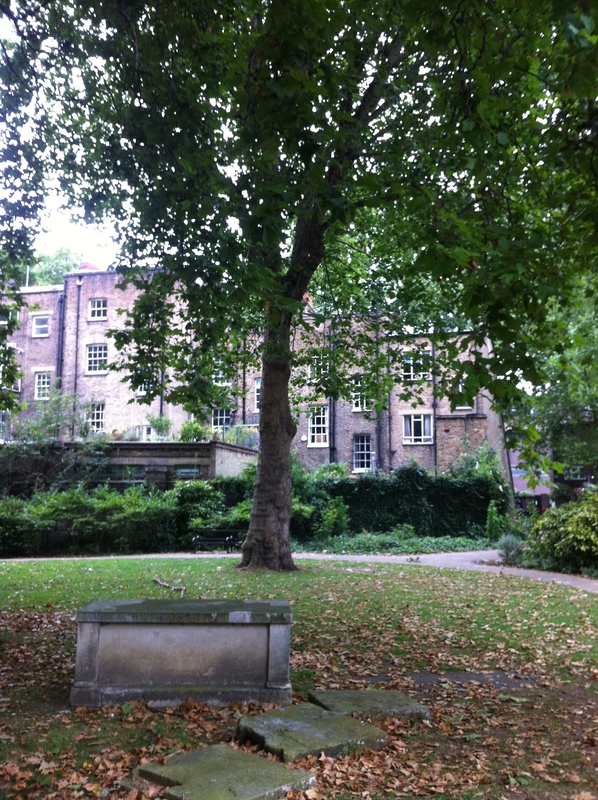 So if you find yourself nearby allow yourself a break and a moment’s reflection in St George’s – not so secret – Gardens. This makes me miss London so much. I lived there for only a year when I was in grad school (I’m from the US) but that was one of the many, many things I loved about London, coming across little nooks and alcoves like these. Glad you liked it. Funnily enough my degree was in English and American studies and I was lucky enough to spend a semester in Milwaukee at UWM. Love visiting the States, especially New York. Another great city where there’s always something new, or old, to discover. And funnily enough, that’s where I am, New York! But boy, do I miss London. I stumbled on these Gardens a couple of months back coming out of the Writing Britain: Wastelands to Wonderlands exhibition at the British Library. 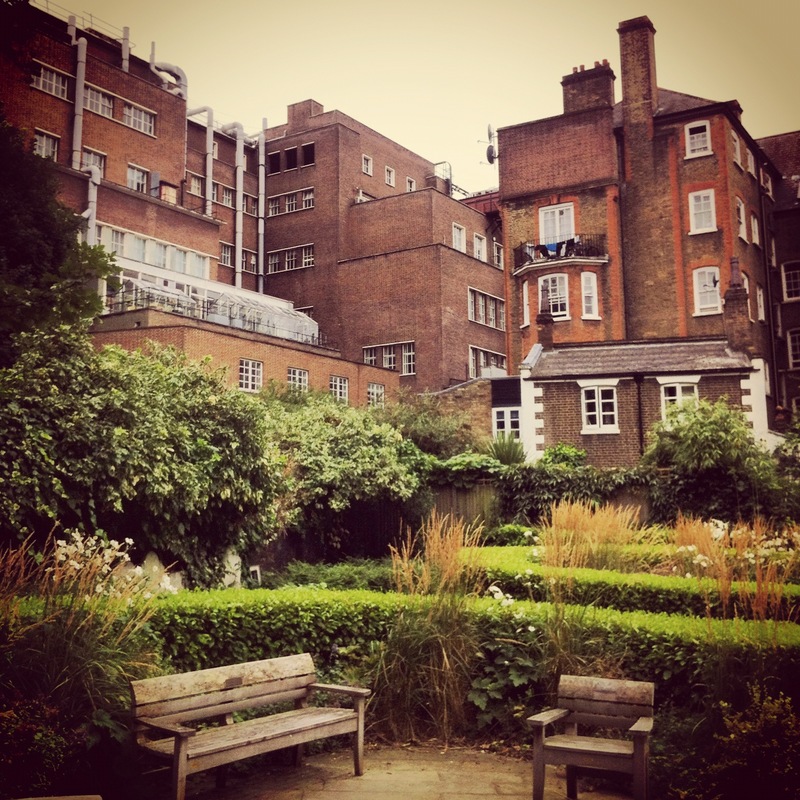 Bloomsbury is a great area to wander around. Strip away the hussle and bussle received wisdom and London is best experienced by walking; always the unexpected around the corner. I loved doing the exact same thing in Highgate. One of the big things I miss about the City. It’s great isn’t it. Pick an area, even, say Nunhead, and there is bound to be something unusual or interesting hidden away there. Still, there’s plenty to uncover where you are – and sounds like you’re enjoying doing it, going by your blog. 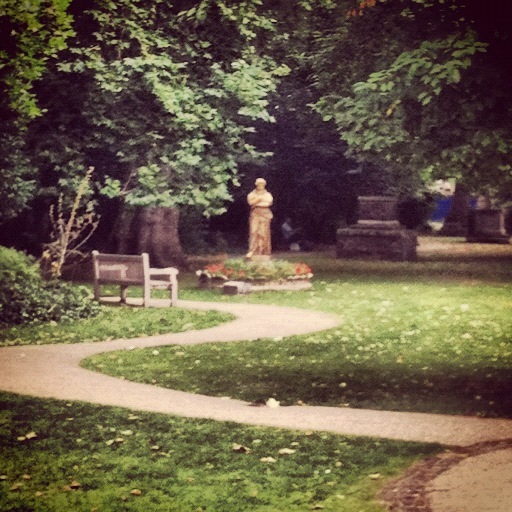 I love St George’s Gardens. Visited it (and had a great picnic there) a few times last year when heading towards the SF exhibition at the British Library. It feels like a hidden corner of calm that has been annexed from Coram’s Fields.